How to Start and Stop the Script Server in SAP HANA Database? 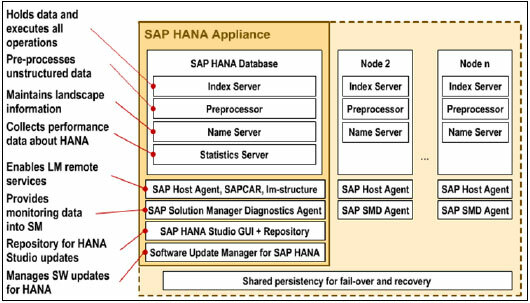 To improve the performance of certain data and performance intensive database accesses of an application the SAP HANA database provides several techniques to process such accesses within the database. By doing so application logic is processed within the SAP HANA database procedures. The use of database procedures reduces the data volume to be transferred between the database and application server. In addition, compared to code running on the application server level, a database procedure can more efficiently access data stored in the database. The disadvantage of database procedures, in general, is that they might somehow affect the stability of the database itself. In order to minimize the risk of destabilizing the SAP HANA database, procedures can be performed on the script server. The script server is one of the SAP HANA database servers, which has its own memory management and is therefore separated from the main server. Its usage is optional. The script server does not store application data. A severe issue, possibly caused by a database procedure, cannot impact the main server of the SAP HANA database. The disadvantage of performing a database procedure in the script server is that data to be processed by the procedure has to be transferred from the main to the script server and the result set of the procedure has to be transferred back to the main index server. Depending on the amount of data to be transferred and depending on the runtime (and the ratio of both) this might reduce the performance of a database procedure up to 30% (possibly even more in extreme cases). The error message mentioned above indicates that the script server is not running. To start the script server follow the steps described below. 1. Open the 'Configuration' tab page in the SAP HANA database studio. 2. Expand the 'daemon.ini' configuration file. 3. Expand the 'scriptserver' section. 4. Change the parameter 'instances' from 0 to 1. This change is possible on the system level and on the host level. Note: The system will start the script server immediately. Note: You have to start a script server instance for each index server instance. To stop the script server change the parameter 'instances' to 0. After the next SAP HANA database restart the script server is stopped.